When you’re out and about, you may not think twice about connecting to public Wi-Fi networks. Sometimes it’s a necessity, like when you need to work on your laptop while away from home or work. Sometimes it helps save money, like when you have a mobile data allowance and want to stay connected but avoid extra fees. And sometimes you may not even know you’re connecting, like when you leave your Wi-Fi signal on and your phone connects to the closest network. While public Wi-Fi has its benefits—it’s convenient and in most cases free—it also comes with drawbacks, including its security risks. Take a look at these public Wi-Fi threats so you can take the necessary precautions to avoid them. 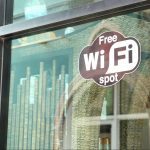 Free public Wi-Fi is a concern because when you connect to free Wi-Fi, it’s generally unencrypted. That means anyone can see what you’re up to over the network. They can see what sites you’re visiting and what you’re typing into them. Even if you’re accessing secure, encrypted websites, they know which sites you’re visiting, although if the site is secure, they can’t tell what you’re doing. There are several ways hackers can leverage these networks to take advantage of you. One way hackers can attack is by placing an access point between you and the public connection. You’ll be sending your information through the hacker, who passes it onto the network to make it look like everything is fine. But once your information passes through the hacker’s access point, he can see whatever data you’ve sent and received while connected to the network. This includes credit card information, important emails, passwords, and more. With this method, it doesn’t matter if you’re accessing secure sites or not because the information sent to his access point isn’t encrypted when he receives it. Another such man-in-the-middle attack uses spoof websites to gather your information. It works by routing your information through a certain device and then showing you a website that looks like the one you want to access. So you think you’re sending information through a secure site, but you’re really giving that information straight over to the hacker. Another security concern with public Wi-Fi is the risk for malware. Hackers can send malware to your computer if you’ve enabled file-sharing over the network. They may even hack the connection point and trick you into downloading malware onto your computer when you connect to the Wi-Fi. Malware is dangerous because it can access offline documents like photos and sensitive documents on your computer. Some types of malware can even access your device’s camera and microphone so people can eavesdrop on what you’re doing in the real world, not just online. Malicious hotspots can happen if a network is infected, but they can also happen when a hacker sets up a hotspot in a public area. They can name the hotspot whatever they want, so by naming it “Public Wi-Fi” or naming it after a coffee shop or nearby business, they get innocent people to connect and then can spy on their Internet activity. The scary part about all this is that it’s incredibly easy to execute these attacks with the right tools. Plus, you don’t have to be a computer wiz to do it. It’s also nearly impossible to tell if you’re being spied on. That’s why taking precautionary measures to prevent these attacks is important, even when you don’t believe you’re at risk. The thing about public Wi-Fi security concerns is that hackers use them because the people connecting over these networks are easy targets. If you take precautions, you greatly mitigate the risk of hackers targeting you. Start with these tips to protect yourself when connecting to a public Wi-Fi network. A virtual private network (VPN) routes all your data through another server to help increase online security and privacy. For one, it encrypts your data, which means that even if a hacker does get ahold of your data, they’d have to decode it to use the information. Not only do hackers have to be good at what they do to decrypt your information, but most won’t bother to try because they’re looking for easy targets. VPNs also make it easier to browse the Internet anonymously because it changes your IP address to one from your VPN provider. VPNs are considered safe if you have to access highly sensitive data like your bank account while connected to a public network. People spying on you can see you’re connected to a VPN, but they won’t be able to see what you’re doing. VPN services for Mac and other devices are available online through various providers for a small monthly fee. SSL stands for Secure Sockets Layer and is a security protocol that encrypts data through the site you’re accessing. You’ll know the site has an SSL certificate because it will show “HTTPS” in the address bar. Ensure you’ve enabled your browser to always access the “HTTPS” option on websites where you enter in sensitive data. This is smart even if you’re accessing accounts that don’t contain any other sensitive data. That’s because hackers know you’re likely to use the same username and password on multiple sites. Once they have the credentials for one site, they can try to use them on others. With “HTTPS” in the web address rather than “HTTP,” it means your data on that site is encrypted. You may be connecting to public Wi-Fi without even knowing it if you leave your Wi-Fi signal on and set to connect with the closest network. If you don’t need to connect to the Internet, such as if you’re working with offline programs, turn it off. That way it won’t automatically connect or transmit data without your knowledge. One of the easiest ways to ensure no one can access your information over a public network—short of never connecting to one—is to limit what type of browsing you do. Don’t access your bank account or enter credit card information over a public network unless you’re using a VPN. Be careful even with email and your social profiles. You may not realize what sensitive data you send through these sites until someone gets ahold of it and uses it against you. It’s usually safe to use public Wi-Fi to surf the web and watch videos, but be conscious of what passwords and credentials you’re entering even on sites that don’t seem to matter. When connecting to public Wi-Fi, there’s a setting on your device that enables sharing over the network. It’s unlikely that you want to share anything publicly, so you’ll want to disable this setting. If you’re on Windows, you can do this by choosing “Public” the first time you connect to the Wi-Fi. This will lock your connection to keep your computer from sharing sensitive data. On other devices, you can check your Control Panel to change the share settings. When it comes to hackers resorting to malware over public Wi-Fi, one way to protect yourself is to make sure your device is secure. With proper malware and virus protection on your computer, you can keep dangerous files from ever installing onto your device. Be sure that your security software stays up to date to minimize your risk. While public Wi-Fi is convenient, it comes with its fair share of concerns. For some people, especially those who work on their computers while on the go, public Wi-Fi is almost a necessity. Taking the right precautions, like using a VPN and securing your computer, will help mitigate your risk and allow you to browse the Internet in public without fear. hy use paid data when you have 'free' Wi-Fi? Sounds really tempting to connect. Well, wronggg. You are throwing away your valuable information at the cost of getting it 'free.' It might be the cafe owner or the hackers who can see all of your information. And unfortunately for you, the only solution is to use a VPN over Public WiFi or carry a portable WiFi device with you all the time. My recommendation is PureVPN that has secure WiFi feature that automatically connects over unsecured wireless networks and encrypts your entire Internet data.